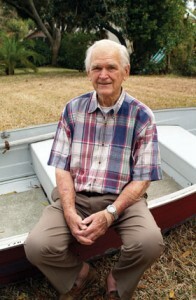 Walt Walters, who cut his teeth in the boatbuilding business at Bertram Yachts just as it was formed in the early 1960s, became an important designer of high-performance powerboats. He’s shown here outside his Florida winter home in 2011. At times it seems like Rovings risks becoming an obit column rather than a file of current industry news, but I make no apologies for recognizing the passing of certain seminal personages. I’m thinking today of Walt Walters, who died last December at the age of 89. He was profiled in PBB not once but twice, first in No. 3, by Pete Smyth, one-time editor of Motorboat and Motor Boat & Sailing magazines, and more recently in No. 132, by me. Smyth interviewed him toward the end of Walters’s long and illustrious career as a builder and designer; I visited him 21 years later at his winter retirement home in Florida. In the following years Walters designed for Donzi, Chris-Craft, Luhrs, Starcraft, Fino, Monza, Botved, Kiekhaefer, Aquasport (the landmark 22/6.7m popularized the center-console open-fisherman type), and many more. He even designed a few sailboats for Bill Soverel.